One of the best known “Houses of Ill Fame,” Malvina Massey’s Crystal Palace was only one of a half dozen or so brothels in Fargo at any given time in the late 19th and early 20th Centuries. Prostitution is known as the world’s oldest profession. It should be no surprise then, that it was one of the earliest to arrive in Fargo, following the railroad into the city in its earliest years. 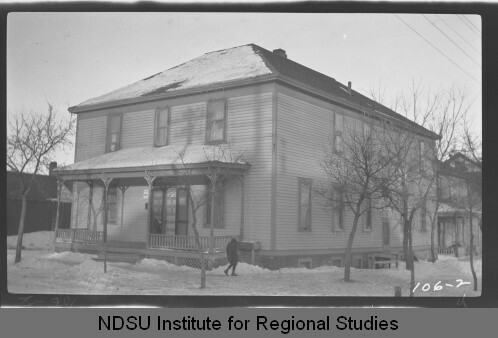 Rather than provide a thorough analysis of prostitution in Fargo or focus on one particular figure, what follows is a brief outline of the rise and fall of prostitution in Fargo in the late 1800s and early 1900s, designed to provide some basic context for understanding where it fits in with the city’s basic story. From the beginning, prostitution had important links to the regional and local economy. The railroad brought madams and prostitutes to the city, as well as many of their customers. According to historian Caroll Engelhardt, traveling salesmen, but especially migrating farm workers who came to the Red River Valley during the wheat planting and harvest seasons, provided the bread and butter for Fargo area prostitutes. Prostitution tended to rise and fall with the agricultural cycle, as did the other vices to which it was so often linked, drinking and gambling. As Engelhardt related in a recent interview and in his book, prostitution in Fargo featured a three-tiered system. At the bottom were street-walkers who plied their trade without a permanent home base, followed by those operating independently and individually with their own “cribs.” At the top were women working for employers, mostly female madams, in recognized “houses of ill fame.” While Malvina Massey’s Crystal Palace was one of the best known establishments, more than half a dozen “houses of ill repute” were typically in operation in Fargo’s red light district, “The Hollow,” during this time period. Prostitution was illegal under both state and local laws, but the way those laws were (or were not) enforced depended on the views of the community, especially of those who held power in the city. Attitudes toward prostitution varied from complete opposition among church leaders and moral reformers, or “purists” to use Engelhardt’s term, to qualified acceptance and toleration from city business and government leaders, the “regulators,” who saw the trade as a necessary evil. Over time, efforts were made to confine prostitution to the established brothels in the Hollow and to make sin “pay its way” through a series of regular fines that weeded out those independent contractors unable to pay them, and really amounted to an unofficial licensing system. The city’s bottom line benefited from the growing fines and a portion of the money was used to police the Hollow and the city in general. As Engelhardt describes it, this approach showed that city leaders and law enforcement saw the institution as catering to an important economic sector and chose “prosperity” over “purity” in the waning decades of the 19th century. The mixed opinions of the community toward prostitution also come through in newspaper accounts from the era. On the one hand, brief reports from the court room and crime blotter sometimes adopt a winking or comic tone in referring to local madams and “soiled doves” (prostitutes). To pick only one example from the dozens of articles found by student and academic researchers in recent years, a May 13, 1898, article in the Fargo Forum and Daily Republican under the heading, “Police Court,” follows the exploits of two local women. “Meal Ticket” (Mary Guthrie) and “Crazy Annie” (Emma Anderson) were both arrested for plying their trade but were able to escape from the police station—the implication being they had help in doing so. On the other hand, as Engelhardt notes, particularly tragic stories of young women in the profession suffering violence or maltreatment often brought a sympathetic response from the local press. While local newspapers sometimes took a somewhat detached or questioning tone, they generally supported the critiques and campaigns of the “purists” against prostitution in their city. In general, these took place periodically, primarily in the off-season, when they would have less of an economic impact, since most of the potential customers (and some of the prostitutes, likely) were not in Fargo. They typically waxed and waned with little long term impact. With the beginning of the Progressive Era in the first decades of the 20th Century, local reformers, civic organizations, church groups and leaders, and most importantly, local politicians came together and began to act with greater urgency and effect. Mirroring national trends, they focused their attention on reforming a collection of vices, including prostitution, with the anti-liquor effort at the core. The links they saw between drinking and prostitution reflected reality as well as their moral concerns. Prohibition had been state law in North Dakota since the early days of statehood and it was violation of this law in her establishment that eventually sent Malvina Massey to the state penitentiary. By 1916, aided by the county option law that finally outlawed liquor across the river in Moorhead, Minnesota in 1915, Fargo’s red light district was finally eliminated. In the end, of course, just as with drinking, eliminating prostitution was not as easy as changing a few laws. Prohibition was defeated when people refused to obey the law. Prostitution remains illegal, but continues to exist. While no one can question the damage prostitution often causes to the people involved, it remains an open question whether a system that recognizes but regulates this vice is more realistic than one that forces it underground. What is clear is that with the end of business in the Hollow, an interesting, if morally-conflicted period in Fargo’s history came to an end. Another reason this focus is not being taken here is that it has already been done very well elsewhere. The best recent work on the history of Fargo and Moorhead is Caroll Engelhardt, Gateway to the Northern Plains: Railroads and the Birth of Fargo and Moorhead (Minneapolis: University of Minnesota Press, 2007). Chapter 6 focuses heavily on prostitution and other vices and is invaluable for anyone studying the issue. This has been recently supplemented by an interview conducted by Dr. Smith and David Flute of the 2013 Digital History Class with Dr. Engelhardt on 11/15/13. A significant portion of this interview became part of the Malvina Massey documentary found elsewhere on this site, which does an effective job of dealing with the story of one of Fargo’s most notable (and notorious) madams. This brief discussion relies heavily on information from these sources and other work of earlier researchers. Readers who wish to know more are directed to these sources. Engelhardt, Gateway to the Northern Plains (Kindle Edition), Location 2810. Certainly permanent residents sometimes consorted with prostitutes and Engelhardt relates several stories of local scandals in which married men were outed for their illicit activities, sometimes in divorce proceedings (see chapter 6 of Gateway). For more on this, see Engelhardt, Gateway, Chapter 6. Engelhardt does an excellent job of telling Massey’s basic story near the end of chapter 6 of Gateway, Locations 2901-2919. See also note at Location 4509.